The early 30's aviation design bureau, lead by K.A.Kalinin, was a capable aircraft design team. One of their projects was a 3-engined passenger aircraft, the K-7, also designated as "K-Tjazholij" (K-Heavy) for the new 500hp German BMW "Hornet" engine. It was designed to carry 22 passengers. The mock-up prototype was tested in the TsAGI wind tunnel in September 1928, and was approved for production by the Scientific-Technical Commetee VVS in March following year. However, production was not started, and the designation K-7 was used again for a transcontinental aircraft project, begun in 1928. 'The idea to built K-7, (K.A.Kalinin wrote later), came to me long ago, as early as 1925. In 1929 the project was formulated and after two years of refinement it started to come to life... With the larger engines available it was possible to consider building aircraft capable of much greater carrying capacity. This led to the design of a flying wing. The new philosophy was "everything is in the wing"'. The original aircraft design was all-wood with a 5-spar wing. 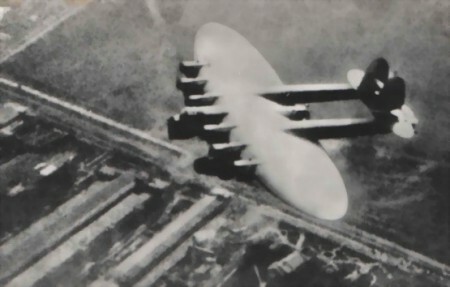 But it became clear that it would suffer from lack of strength, and after much discussion, K.A.Kalinin decided to switch to an all-metal welded construction with a 3-spar wing. The K-7 was a gigantic elliptical wing of extremely thick airfoil (span 53m, area 452m2) with two triangle section tail booms, carrying tail fin and tail plane with control mechanisms. The straight wing (width 6m, length 10m, height 2.33m) had room for payload and people. Elliptical consoles with 14 fuel tanks were attached to the centroplane. The centre was covered with duralumin, consoles with fabric. There were no thick tubes able to comply with the requirements of the central spar so it was made of two parallel tubes. The rest of the wing frame also was made of welded steel tubes. A nacelle protruded from the leading edge, with a cockpit for two pilots, navigator, radio-navigator and chief mechanic. Seven more crew members were located in other sections of aircraft and communicating by internal telephone. The aircraft was designed for 6 BMW engines, but a later decision was made to install Russian made AM-34s. The six water-cooled engines lacked power, and K.A.Kalinin was forced to add a 7th pusher engine on the trailing edge of the wing between the tail booms. The designer was aware that this engine would increase airflow turbulence and would lead to vibration of the aircraft, but he had no other choice. Early AM-34 engines were not equipped with gearboxes and had power of only 750hp. The triangular tail booms protruded from the last spar to the tail. The tail booms were equipped with tailwheels, protecting the tail from contact with the ground. The original main gear design allowed the aircraft to be horizontal while on the ground. 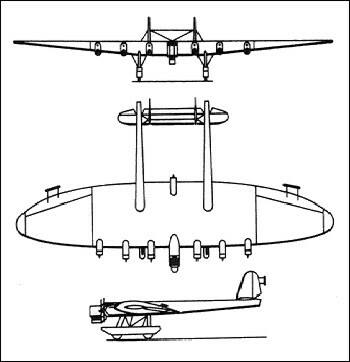 The main gear consisted of two widely placed gears of frame design with oil-pneumatic wheel suspension, the first attempt in Soviet heavy aircraft. Each main gear had 3 wheels and were covered with fairings - the left gear had an entry door and stairs leading into the wing. At the design stage it became clear that it would be hard for the pilot to control the plane because of the enormous load on the controls. For the original design, K.A.Kalinin proposed electric 'boosters'. A contract was signed with one of Moscow electro-technic institutions, which undertook to develop and manufacture the new system. But they failed to do so, and the control planes of the K-7 were equipped with control surfaces, placed on light booms. Theoretical problems of heavy aircraft control by use of control surfaces were solved by the aerodynamic team lead by N.F.Freiman. On the TsAGI wind tunnel more than 300 successful tests were performed, and in 1932 the surfaces were tested on the K-5 flying laboratory. The system workedperfectly, and it was recommended to install them on the K-7. K.A.Kalinin also decided to use chromium-molybdenum tubes for the aircraft frame - it was the very first use of such tubes in Russia. Calculations for the frame were lead by Professor A.S.Balinsky - a prominent scientist in the field of materials strength. Sadly, aircraft was already overweight while still in the design phase, because calculations had to take into account loss of strength of tubes near wielded joints. Steel tube production started (at the same time as the aircraft design) at the Dnepropetrovsk Metal Works. Until now, tubes were imported from Sweden, and to buy tubes for a single K-7 could cost as much as 100,000 golden Roubles. The TsAGI commission noted in 1932, the K-7 represented a big step forward in aircraft design being the first to employ the use of chrome-molybdenum tubes in the USSR. The K-7 was designed as a multipurpose civil and military aircraft. One of passenger options was developed to carry 128 passengers up to 5,000km. Another design - "luxe" - was supposed to arrange 16 luxury cabins for 64 passengers. The aircraft was supposed to have a comfortable club-room, snack-bar and kitchen. This was the first aircraft design allowing mechanics in-flight access to running engines. A lot of effort was spent on the K-7 by an armament team lead by D.I.Grigorov. The military version of aircraft was a real "flying fortress", which emerged 10 years before the American Boeing B-17. Defence of Kalinin's giant used as many as 12 gunner positions (8 20mm cannons and 8 7.62mm machine guns). A special electric cart (running on strings inside of tail booms) was designed for transportation of gunners to two tail machine guns. The aircraft had no "blind spots", and every direction was covered by 3 gunners, which greatly increased its defence capability. Bombs were located in wing bomb bays, and bomb bays frames were included into wing structure. Depending on the required range, bomb loads varied from 9,900kg to 16,600kg (25,550 - 42,840lb). External fuel tanks allowed 2,400km flight with 6,000kg bombs. Other military modifications could carry 112 fully equipped paratroopers. Opportunities to carry an 8.4 ton tank or other parachute droppable equipment between main gears was also under study. The technical project was completed early 1932. In the yard of the Kharkov Aviation Factory, a full size wooden mock-up of the aircraft central part was built. The size of aircraft was too big for existing manufacturing areas, and new assembly hall was built. In November 1932 assembly of a prototype aircraft started which completed just in nine months. In the early August 1933 the aircraft was taxied on to the runway. Its test pilot was M.A.Snegirev and the co-pilot was A.N.Giatsinsky. When all of the engines were started a serious vibration throughout the aircraft was noted so the affected parts were quickly strengthened. On August 19 A.M.Snegirev made the first straight flight at 5m altitude. More troubles were revealed - the elevators were vibrating with amplitude up to 1m! In a few days the tail of the aircraft was redesigned - it became a 'biplane' with an additional stabilizing surface between tail fins. Surfaces from the tail fins were removed, and those on the tail planes were moved closer to the elevators. The day before the first flight P.I.Baranov (head of the Major Management of Aviation Industry) together with test-pilot M.M.Gromov arrived at Kharkov. At 6 a.m. August 21, 1933 K-7 was 'on the start' with running engines. The weather was fair despite some light clouds. Seven crew members took their positions and, as usual, at the last moment, the co-pilot's seat was occupied by Kalinin himself. After few taxis, the plane took off smoothly. As A.M.Snegirev said later, 'the aircraft was very responsive. It was easy to control. Hard to believe, but you just pull the yoke - and machine responds'. The K-7 made a circle over Kharkiv, and safely landed on the factory airstrip. In the next flights it became clear, that vertical vibration was gone with the new tail design, but vibration was still present in horizontal surfaces. M.A.Snegirev, employing his experience as a test pilot, found a way to suppress it by changing the engines power settings. Continuous tests revealed fair flying characteristics. The last factory test flight was scheduled for November 20, and the plane then had to be flown to Moscow. It was planned to measure the maximum ground level speed. This flight (10th one) was completed successfully, but the ground team made a mistake which spoiled the measurements. The next attempt was planned for November 21. The K-7 now had over 5 hours of flight time. The flight plan included approaching the 'measured kilometre' at an altitude of 1000m, then diving the aircraft to 100m and exceeding the VNE. At 2p.m. the K-7 took off with 20 crew members on board. Here is the story of D.A.Chebyshev, one of ground engineers who participated in the tests : "As scheduled, K-7 flew over us and the pilot saw that we were ready for measurements. The aircraft made a turn, accelerated and started the approach. At about 3 to 4kms from us it made a sudden dive from 300-400M at full speed. First contact with the ground knocked away the landing gear. The aircraft bounced and with the engines running it hit the ground again. A fire started..."
What was recalled by one of the five surviving crew members, P.I.Semerenko : "Approaching the 'measured kilometre' Snegirev gave full throttle. The tail booms vibration increased. I counted 15-20 major shudders. Suddenly, to the noise of running engines was added the sound of the left tail boom lower tube braking apart. Displaced tube edges locked the elevators, and the K-7 was not able to get out of the dive. Near the surface the aircraft went into a left pitch. I was waiting for the end. Controls were still locked still dead. Smash..."
After obtaining expert reports, revealing no mistakes in aircraft design, the head of GUAP ordered Kalinin to start urgent production of two new (passenger and military) K-7's with scheduled roll-out in the beginning of 1935. Production was assigned to new base - The Voronezh Aviation Factory. Changed views in the country's aviation leadership on production of heavy aircraft did not allow the team to complete development of K-7. Both planes were 'preserved', one of them half-built. 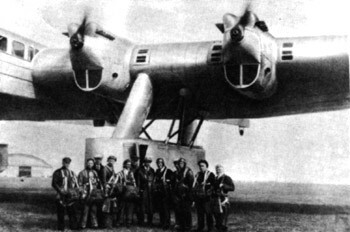 Kalinin tried to prove necessity of this aircraft type but failed to win over the opposition to his project.